This beginner knit pattern is that perfect wardrobe staple for those warmer months! Simple, comfortable, and you can dress it comfortable in tunic with leggings, or dress it up! With full back and racerback options you can change up the look. Included lengths are: cropped, shirt, tunic, and dress! And added to that are 4 different hemlines: side dipped, high low, hankerchief, and curved. I also include measurements and instructions to add the bow to the back of the racerback option! You could make one for everyday of the summer with a different option combo! This is semi-fitted at the bust and flares out for a looser flowy fit over waist and hips. Comfortable, flattering and so easy to throw on! This pattern comes with sizes XXS to Plus 3X. 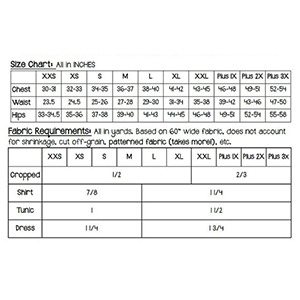 Suggested fabrics are knits such as cotton jersey, cotton lycra, or jersey rayon.